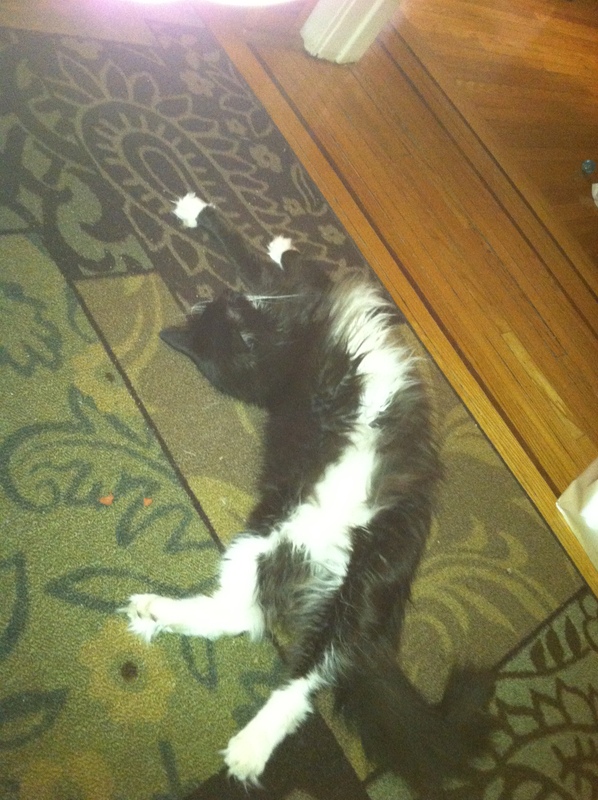 Our cat Desmond is a killer. I’m using a pseudonym to protect him from retribution. He can’t help himself: cats are natural predators. He’s originally from Florida and is an indoor/outdoor cat. We don’t know how he ended up in New Jersey, but we adopted him from Petco in Paramus in 2011. He was about 4 years old at the time. Desmond is quite meek for a cat of his size and stature–a Norwegian Forest. He is the feline equivalent of Rubeus Hagrid in the Harry Potter books, a gentle giant. So gentle that he cowered at the sight of a large bunny in our backyard. 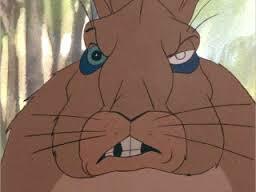 Lorin referred to this bunny as “The General” from Watership Down. Perhaps The General terrorized Desmond when we weren’t around. Our town is teeming with bunnies: I saw four huddled around a truck in the parking lot near the bus stop yesterday. You never know what they’re up to. Desmond patrols at night: he guards our property and keeps other cats away. It took him a while to adjust to us. The sign that he cared came in the form of gifts: a dead bird at the back doorstep was the first. Two more birds followed. For cats, dead prey on doorstep = love. He’s bringing us dinner. Then came the baby bunny. It wasn’t bloody, so perhaps it died of a heart attack after he chased him. We’ll never know. We felt kind of bad about it, but thanked Desmond and patted him on the head. Not wanting to appear ungracious, we let him inside before wrapping the bunny in a plastic Shoprite bag and depositing his remains in the trash. Last week another baby bunny was deposited, but this one was missing its head and one arm! Is Desmond developing a taste for blood? Did he eat the head and arm or did they become dislodged as he was playing with the bunny? Perhaps he is exacting revenge on the Leporidae community for being humiliated by The General, or realizing there is an overpopulation, he might instinctively be culling the herd. You may judge us for harboring a bunny killer, but he is only doing as nature intended. Do not judge us or our feline companion too harshly; however, if you are out to punish someone, punish us. We are his caretakers, and we take responsibility for his actions . . . to a certain degree. Nature dictates the rest. Have you looked in your backyard lately? Rabbits are on the rise. Personally, I have no objection to bunnies being killed by cats in the suburbs. But it breaks my heart that the local birds are preyed upon. Please consider keeping the cats inside at night; during the day, the birds have a fighting chance. I’ll confess that long ago I had a cat while living in Manhattan. One day when I’d left her too long, there was a dead pigeon on the windowsill. I felt bad about both the bird and the cat.